Quilting and Life in General: It was a little (very crowded with projects) sweat shop this weekend! It was a little (very crowded with projects) sweat shop this weekend! But first - we went to Crater Lake this week to meet up with friends from Nebraska. The last time they had been here was for A&J's wedding - so we took a little show and tell too!! 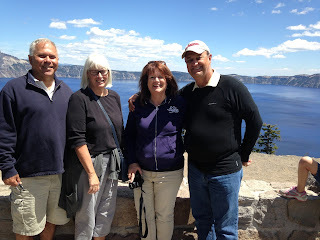 So happy to be able to meet D&S, they're here visiting new grandsons - yes twins! 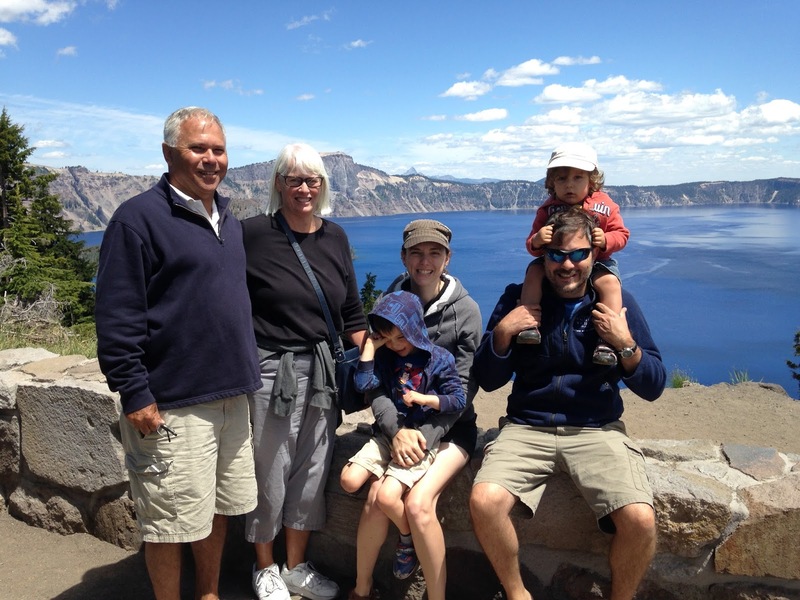 They had never been to Crater Lake before and boy were we spoiled by great weather and a gorgeous view. Now back to our regularly scheduled blog!! This weekend I had such high hopes! As always! I had a list of MUST-DO yesterdays! 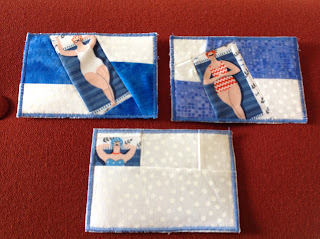 Summer postcards for two Stashbuster friends. 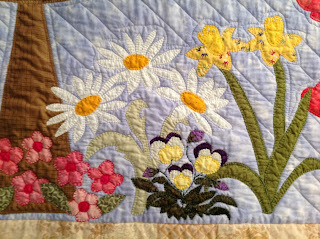 I found this adorable fabric last year at the Newport Quilt show and just had to have a little! It first made it's appearance on a notebook cover, And then by squeezing it sideways and lopping off the toes (they weren't painted anyway!) I fit her in. I love them! And I was able to fit in the 1/2 woman left in the row! I love to put a little design on the address side too! 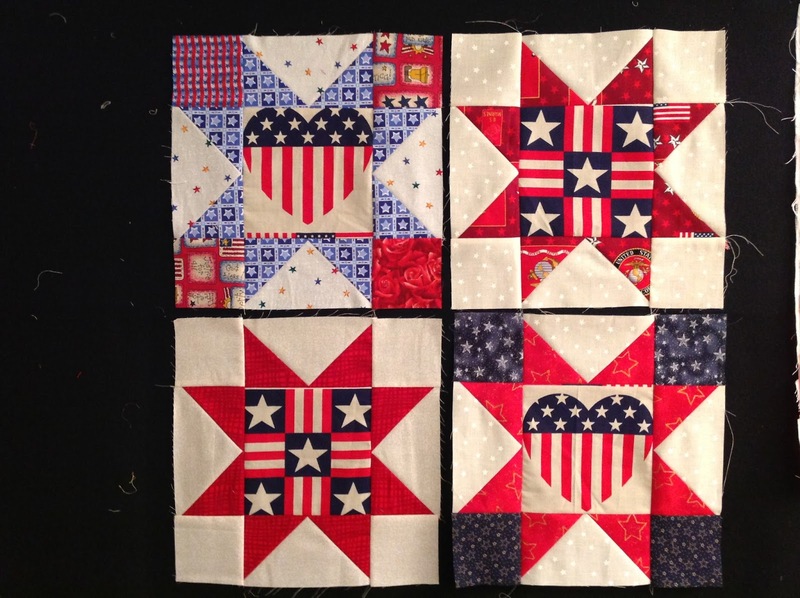 Newport Guild supports Quilts of Valor and we picked up the fabric kits for 4 blocks last meeting. Of course, I couldn't find mine (if something is missing - look in the computer bag!!!) So it was the last minute to get them done by TODAY!!! I'm happy to report they went fast! 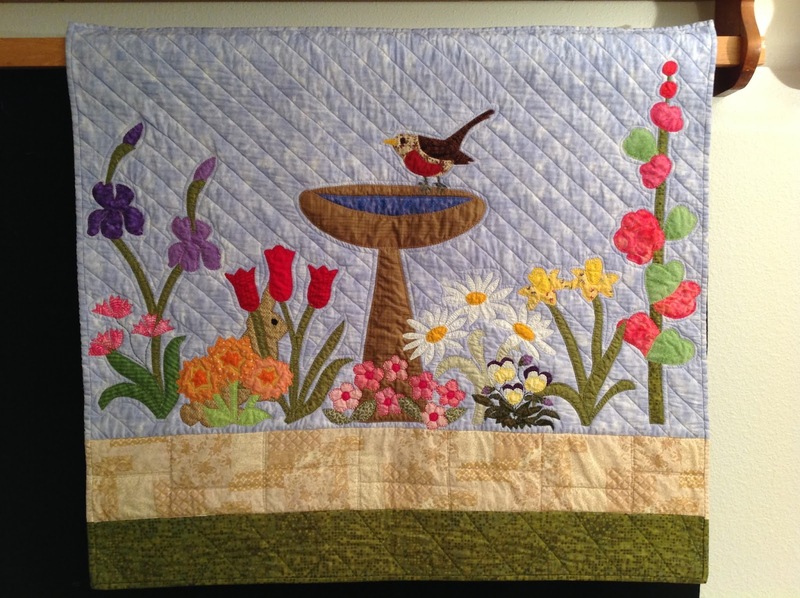 The Newport guild organized the Memory Garden BOM in 2013. N had all the copies made, templates printed on freezer paper ... yep, she's a hard act to follow!! And may I say, my, time went fast! We signed a "contract" to display the finished quilt by this year! I received my "dunning" notice and panicked. 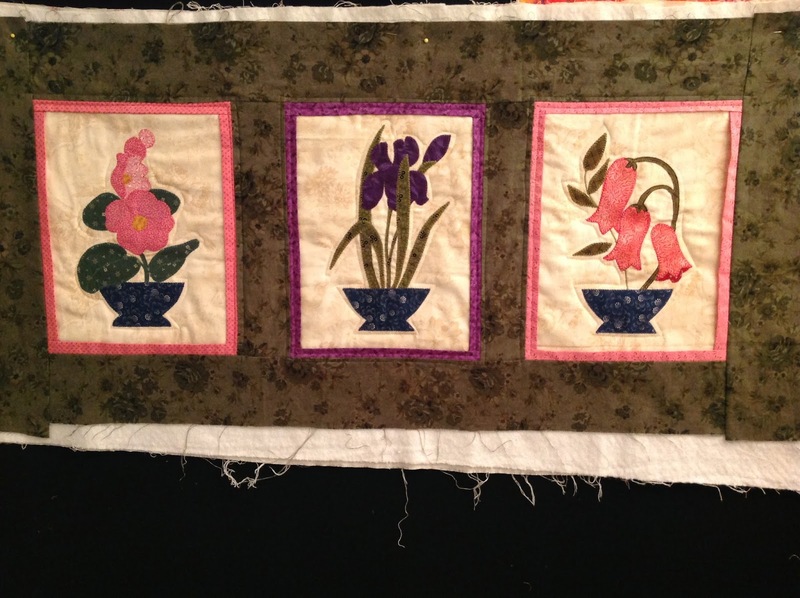 These are the blocks - now in a small wall quilt for the Silent Auction at the show. The project I didn't get done this weekend. But I wanted you to see the blocks - scroll down and see how I interpreted them! TA-DA!! I remembered all the gardens I weeded for my mom or planted myself. 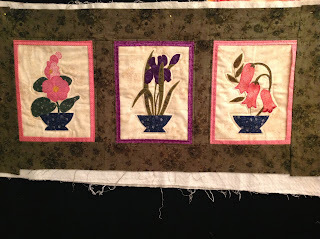 The flowers were all in the blocks - or at least some of them could be changed in color to be the ones I wanted. I had to add Johnny-jump-ups. Got them from a coloring page out on the web. 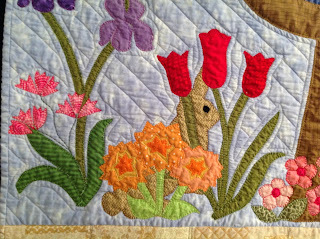 And besides the robin, every garden needs a rabbit to entertain and frustrate you!! We had "Frick and Frack" in Princeton Jct!! So, watch out when you so innocently ask, "what did you do this weekend?" You could be in for an hour long slide show and explanation!! tee-hee! It was HOT, HOT, HOT this weekend at the Retreat I attended. Not the kind of Sweatshop I have heard of. I was pedal to the floor Thursday, Friday & Saturday. Check out all I did on my BLOG. oooh i love your beachy gals fabric! and you WERE a super sewer this weekend indeed! Wow somehow I missed those postcards the first time. I want to have a go at making them. I guess I need to just do it. I thinking your example would be a good first try! Let the fabric work for me.